ObamaCare: Am I Required to Buy It? Questionnaire ObamaCare: Required to Buy? The Affordable Care Act may require you to pay a penalty if you don’t have proper coverage. 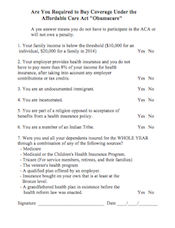 This simple questionnaire allows you to understand your responsibilities under the Affordable Care Act at a glance. If you answer “yes” to one or more of the questions, you may not have to participate in the Affordable Care Act (or may not owe a penalty). Download this free guide to learn if you are required to purchase health insurance under the Affordable Care Act.